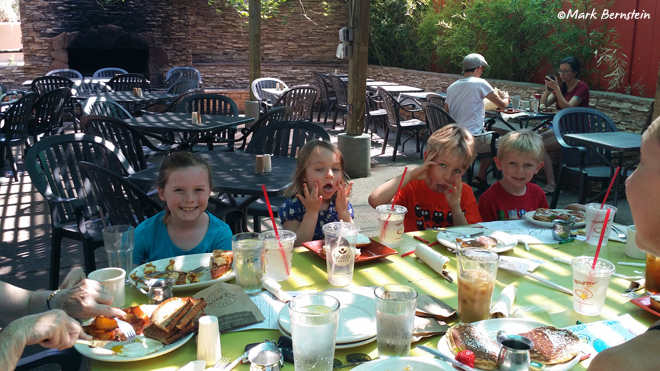 In Albuquerque the weather is not only comfortable, but downright beautiful most of the year - the perfect location to enjoy dining al fresco. If you&apos;re looking for a secluded hideaway, live music, or beautiful views, Albuquerque has a patio for everyone. Begin your tour at 6,559 feet at Sandiago&apos;s Mexican Grill at the base of the famous Sandia Peak Tramway. 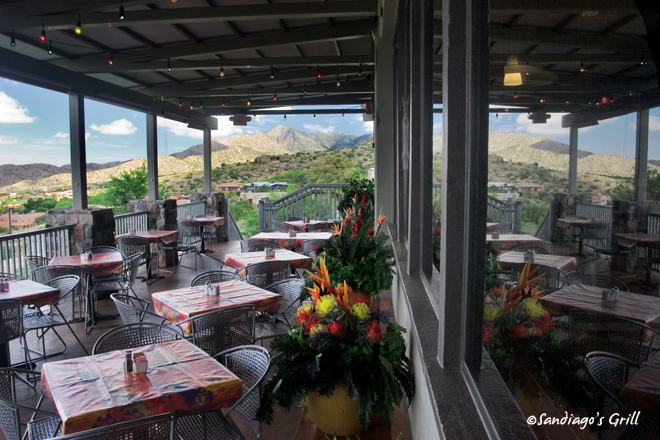 Take in the view from the base of the Sandia Mountains for lunch or dinner from 11am-8:30pm daily. Make dinner reservations around 7pm then buy a tram ticket and enjoy the 15-minute ride on the North America&apos;s longest tramway that takes you 2.7 miles to the top of Sandia Peak at 10,378 feet. Summer sunset is around 8:30pm and the breathtaking view of Albuquerque at two-miles high is something you&apos;ll never forget. Tractor Brewing Company&apos;s Nob Hill Tap Room would be strange to mention for patio dining, as it doesn&apos;t even have a kitchen, if it weren&apos;t for the rotating local food trucks parked outside year-round. Grab a Hay Maker Honey Wheat to quench your thirst, or try a seasonal flavor like the C&C IPA to go with your munchies. Open 3pm-12pm Mon-Th; 1pm-2am Fri & Sat, and 1pm-12am Sun, the view from Tractor is one of the best-kept secrets in Nob Hill. Situated on a precipice of the actual "hill" of Nob Hill, it reveals a city view of the Sandias most have never seen. You can even sit on the giant tractor outside while you wait for your street food. 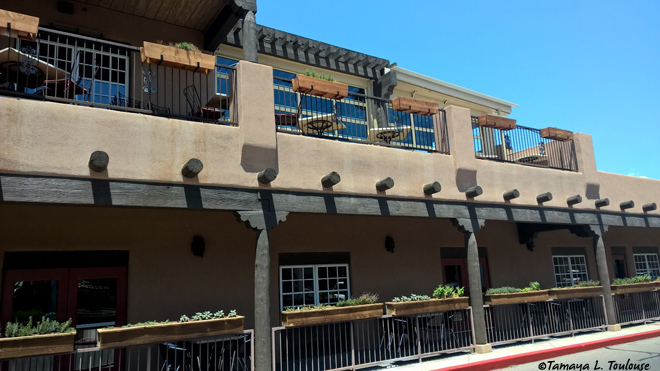 Seasons Rooftop Cantina in the heart of Old Town is an outstanding happy hour or dinner spot, open 4pm-10:30pm daily and overlooks both the Sandias and Old Town Albuquerque. The hand-crafted drinks can&apos;t be overstated: fresh simple syrup, hand- muddled lime and mint for mojitos, and Sangria made from scratch. The Cantina menu features fried salmon wontons, and the "Best Damn" Buffalo Wings are a spicy, crispy delight. Seared rare Ahi tuna tacos and the Bison Sliders contribute to an eclectic and satisfying menu. Enjoy the patio in a relaxed, upscale atmosphere with a side of live Jazz Saturdays and Sundays from 6:30-10pm, all summer through Balloon Fiesta every October. Last, but not least, Flying Star Café is an Albuquerque favorite brought to us by New York natives to delight our palates for the last 28 years. They are renowned for the sumptuous, handmade desserts served NY style in glass cases. Hours vary by location but all are open at least 7am-9pm daily. All seven locations feature "petio" dining, where pets are not only allowed, but welcome to enjoy the shade and breeze with their human companions. The Rio Grande petio boasts beautiful hanging vines, and a large stone fireplace that makes spring and fall al fresco dining a cozy pleasure. Flying Star serves locally roasted Satellite Coffee, and the green chile turkey sausage is second to none. 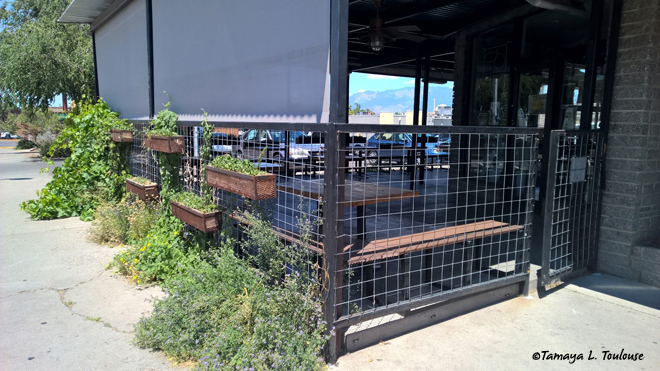 Head out hungry and prepare to be satisfied by the many diverse patio spaces in Albuquerque - cheers! Tamaya L. Toulouse is an Albuquerque native with family roots reaching back over 200 years in New Mexico. She has a BA in Dance from the University of New Mexico and an MBA in Small Business. Tamaya is the Performance Companies Manager at the National Institute of Flamenco and a professional consultant for performing artists. She loves rediscovering New Mexico year after year with her husband and two sons. Tamaya enjoys introducing anyone she meets to the beautiful Mestizo culture of New Mexico through culture, art, & food.